In what appears to be a potential Public Relations nightmare, the beloved Vancouver Canucks colour commentator for the past 33 years has been released - his last game to be versus Los Angeles this Saturday - due to what appears to be the result of posturing prior to a bid for Canucks radio broadcast rights, and the result of censorship. Iain MacIntyre reports that Larscheid will call his last game this Saturday. 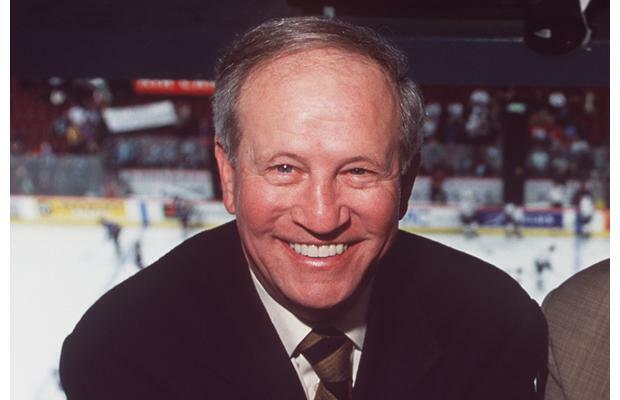 Larscheid was an Americanborn former football player when he was hired in 1977 to work with play-by-play icon Jim Robson on Canuck broadcasts. As MacIntyre reports, Larscheid was not one of us. He did not grow up with the game, attending hockey catechism every Saturday night. He shouldn't have lasted the season. Instead, he lasted 33 years because his passion and enthusiasm and sharp instincts so emotionally connected him to fans that Larscheid's tone became the listeners' gauge for whether the Canucks were playing well or badly. In the history of radio, has another team analyst told the general manager on-air to "take a walk" in mid-interview, as Larscheid did one night when he essentially evicted Brian Burke because the GM was sullen and terse? After an overtime loss in Dallas, caused by Jan Bulis' stupid penalty, Larscheid told listeners: "Let's be honest here; this is one dumb hockey player." Just last season, Larscheid called general manager Mike Gillis's former client Pavol Demitra a "$4-million bust" and said Roberto Luongo, merely the team captain, was one of the worst puck-handling goalies in the National Hockey League. So, really, it's no wonder TEAM 1040, with the Canucks' implicit approval, fired Larscheid in July. The hockey team has long held a veto over its radio broadcasters. Larscheid was told at his dismissal meeting that the Canucks were "on-board" with the decision. The lucrative radio rights are up for renewal in two years. The all-sports station's mammoth rise was driven by credibility gained with the rights to the Canucks and B.C. Lions. The bidding in two years will be fierce, and could include Rogers Communications, the Canucks' new business partner, which owns CKWX 1130. Tony Gallagher meanwhile, has published an article sharing a couple of stories about the man that Tom Larscheid is. After 33 years, they could have let the man retire with dignity! Larscheid put his heart and soul into the team. He told it like it was. Shame on the Canucks organization for supporting this move. But this is quite an old story, only reason it's making headlines is because he's doing his last game on Saturday. I think the opportunity for it to be a "public relations nightmare" has passed.